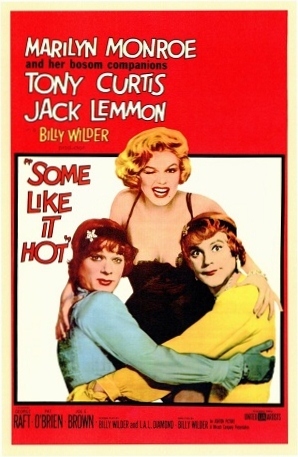 Director: Billy Wilder Cast: Marilyn Monroe, Tony Curtis, Jack Lemmon, George Raft, Pat O’Brien, Joe E. Brown, Nehemiah Persoff, Joan Shawlee, Billy Gray, George E. Stone, Mike Mazurki, Dave Barry, Beverly Bills, Barbara Drew, Edward G. Robinson Jr.
Did You Know? One of the few American movies ever given a “Condemned” rating by the Roman Catholic Legion of Decency. Quotables: JERRY: You don’t understand, Osgood. I’m a man. OSGOOD FIELDING III: Well, nobody’s perfect. I wanted very much to like this film. This was an oft-referenced movie in my theatre classes in high school, by both my teacher and fellow classmates. But every time I’d find something funny, it would turn around and just be another misogynistic movie. Is there anything more hilarious than a straight man, dressed as a woman, enduring persistent unwanted sexual advances from another man, who just can’t take no for answer? It’s just soooooooo funny seeing a man be objectified one time like women are on a daily basis, isn’t it?